“Lichtspiel Mutation 2 – Alechsis” was originally composed for a live performance for electronic music and video projection, based, inspired and retranslating the 1948 film “The Amazing Mr. X” by Bernard Vorhaus. While I can’t say I have seen the movie, I don’t find it terribly necessary to attach this basic catalyst of a movie to the outcome that I am listening to. For Marcus Fjellstrom it was an important method of conjuring music from himself to the outside, but for us the focus will be on what we hear, made by his hands and mind, without attaching it to specific visuals. Nevertheless, this 21 minutes long album did suggest of a certain eerie memory trace of an old surrealistic movie, especially on the second track, “Temple”, that offers semi-disharmonic tones and dreamy offbeat liquid sounds. “Musical Key” adds a little touch of horror to this sweet sleepy state and other tracks, such as “Ramos Sings” become entirely abstract and instinctive. 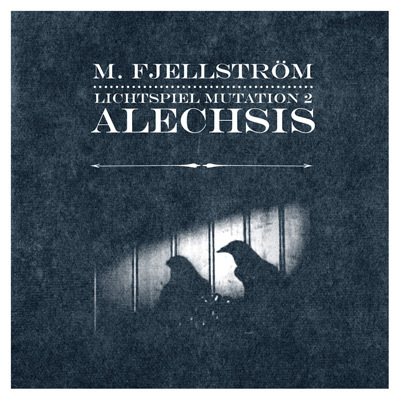 Marcus Fjellstrom creates a rich, unsettling world of uncertainty and dark wonder through seven chapters on this powerful 3″ album. I do not know how the visuals looks like, both in the original movie and in the video projection of this installation, but ” Lichtspiel Mutation 2 – Alechsis” has invoked some vivid imagery in my mind in the past hours of listening to it, and that’s more than enough.